It was a successful weekend for Ballymore Stables, two of our best three-year-old males racing right up to their best form in the Gr.3 C.S Hayes Stakes. Winning on protest after enduring a tough run, Tivaci showed great heart to salute whilst Tulsa, who also found trouble, finished off strongly for an eye-catching third. And they are both on target for a crack at Group One glory with a couple of options - the Australian Guineas and the Randwick Guineas - run on the same day. "The problem is neither of them have been right-handed," Michael Moroney said, adding that he may end up racing them both in the Flemington feature - "we will see." The stable is in great form and we hope that continues during the week with three nice horses heading to the races in the next couple of days. The first of those is Geodesic (pictured) who pulled up well from his excellent debut fourth at Ballarat a few weeks ago. Finishing off strongly despite racing greenly, the handsome son of Domesday still does a bit wrong in his work at home but once the penny drops he should mature into a nice horse. 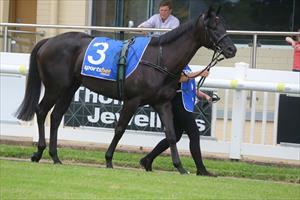 "His lack of race smarts is some concern but he is a promising horse in with a winning chance," Moroney said. We have two runners at Sandown Wednesday, the first of which is the exciting filly Wichita Woman who has "trained on well" since her barnstorming maiden victory. "She faces a tougher race this time but she is a filly we have always had a lot of time for." Nicely primed for a rise in distance is Our Valdivia who looks nicely placed in the Le Pines Handicap. "It looks a good race for him and he is nicely drawn," Moroney said - "he should prove hard to beat.